"I came to the memorial not only to hear historical descriptions or about the established fact of the Holocaust. I came as a Jew, hoping to hear an apology and a request for forgiveness from those who caused our tragedy, and among them, the Germans and the church. But to my sadness, I did not hear any such thing...everything that we feared came to fruition" (source). This last sentence is particularly absurd. At any rate, this demonstrates the fact that in Jewish-Catholic relations, the Jewish side does not really care about what the pope says, or what his message is, or building true understanding between faiths. They simply care about prying an apology out of the pope, and if this can be done, than everything he else he says can be let slide; but if he doesn't apologize, then nothing else he says matters. If you read the article quoted above, you will see that all the Jews who attended the pope's talk did so for the explicit fact that they "expected an apology." The same holds true for the Muslim leaders meeting with the Pope, who were all incensed that he didn't offer an apology for his Regensburg remarks (source). The Pope certainly has nothing to apologize for on the part of the Church - the quote above is outrageous. It is one thing to say that certain segments of the Church perhaps could have done more to stop the Nazis. Maybe I'd entertain that - but to say that the Church "caused our tragedy," as the Knesset speaker said? That is ludicrous. The Church had no direct or indirect part in causing the Holocaust. Nor can he really apologize as a German, since the Germans have pretty much rejected him as somebody who can speak for the nation. Is every German born person until the end of time going to be pressured to issue all sorts of apologies for the Holocaust? We have to draw a distinction here: we are rightfully upset if someone expresses anti-Semitism, or denies that the Holocaust happened or similar things. But to see so many people get outraged because, to quote another article, the Pope "failed to express enough remorse for the Holocaust" is stupid (source). Since when is "failing to express enough remorse" a crime, and besides, who judges when someone has "expressed enough remorse"? What is the definition of "enough remorse"? Another Jewish columnist described the Pope as "restrained, almost cold" (source). What does that matter? Is the way a journalist interprets the demeanor of the pontiff any grounds for wild accusations? That's almost as absurd as the Medjugorje enthusiasts claiming JPII approved their apparitions because he smiled at a banner (see here). "The pope still had not made it absolutely clear that Jews did not need to embrace the belief that Jesus was the messiah to be redeemed." The Rabbi mentioned above cited, of course, Nostra Aetete to the fact that Jews need not accept Jesus and called on Benedict to make this declaration more specific (source). This, of course, would be nothing other than a denial of Jesus Christ, pure and simple. Am I being too extreme here? I think not. It was Christ Himself who said (listen carefully, Dr. Weissman) that "nobody comes to the Father except through Me" and "anyone who comes in any other way is a robber and a thief." This is what interreligious dialogue comes to: it is nothing other than a collective attempt by the other religions of the world to force the Catholic Church to institutionally apostasize by declaring error to be truth and truth to be error and is demonic in origin. Look at the tremendous pressue the Holy Father is under to deny that all persons are in need of Christ! I wish he'd stand up in front of them all and say, "Repent and believe the Gospel of Jesus Christ and you shall be saved!" Would that damage relations with Muslims and Jews? Well, they're not that great right now, despite all the egg-shell walking and pussyfooting around the issues. Why not just say what the Church has always said and let the Jews and Muslims deal with it? As I've mentioned before, we don't need any "alliance" with the other monotheistic religions against secularism. As far as I'm concerned (and I think Scripture and Tradition bears this out), when it comes to the Church against the world it is sola ecclesia; we don't ally with Pagan X so we can better defend against Athiest Y. That was the mistake of Israel: thinking they had to ally with Egypt and Syria against Babylon and Persia. As was the case then, so it is now: the Church's monotheistic "allies" don't care about preserving the Church - they care about weakening it and compelling it to deny its perennial teaching. One rabbi recently called for the establishment of a "UN of religions"; wouldn't that be great! (source) All the ineptitude of the United Nations mixed with the theological muddiness and stupidity of the worst of the interreligious dialogue movement. Pray for the Holy Father, for he is under pressure by enemies within and without to publicly deny Christ, which any assertion that Jews don't need Jesus would indeed be. 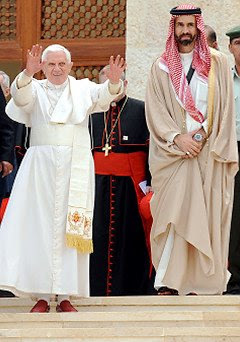 I wish the Pope would come to the Holy Land someday and just totally ignore all the other religions there - I wish he'd just visit Bethlehem, the Cenacle, the different Christian sites, give addresses to only Christians and then just blow off the rest of them. Meeting with these other leaders of different religions has become too compromising, and they are only out for blood - chomping at the bit just waiting for the Pope to "apologize" for something and then raging when he doesn't. Please Holy Father, stop going on these trips. It is too difficult to watch. What a bunch of whiners. What does it matter to them if we say they need Jesus? They think we are all following a false prophet and false teachings anyway. I hate when outsiders feel the need to tell us how to govern our theology. I personally don't understand inter-religious dialogue either. I'm all for clarifying where each group stands, but what can really come of it? Either Jesus is God or He isn't, there is no in-between. Its a little different with Protestants. With them its a matter of hammering out a common lexicon so we can 'debate' the issues of apostolic authority et al. Once again someone says "this has changed based on Vatican II document X." Has anyone ever done this with Trent or Vatican I? There is such confusion during and after the council to the point where non-Catholics are confused to what the Church is trying to say. A modern council should not yield such results. The weakness of Vatican II and the late 20th century Popes shows. Could someone point me to a blog article or a good book that discusses Nostra Aetete? I simply don't understand that document, I feel like it is a huge betrayal of orthodoxy, but what do I know. Frankly, if I had to point to one spot of painful cognitive dissonance in my life, it's that document. I want to be a faithful Catholic and yet this unfaithful fuzzymindedness is presented to me as "the faith". Attention is like gasoline on fire. I loved the Holy Father's remarks about using reason as the common ground. If only the various parties would heed him. I'm afraid they won't. This is a pretty good point-by-point explication of the documents. Amen!! Your comments on religious dialogue are excellent and true! I stumbled on this blog when my children were shown a video questioning the validity of the Catholic/Orthodox claim that Mt. Sinai is where Moses received the Ten Commandments. I am glad I did - this is a great site! Thank you!